First impressions mean a lot in any field of work and probably even more so for baseball players. LaTroy Hawkins’ brief Yankee career got off to a bad start, even before he threw his first regular season pitch in pinstripes. It was the third game of the season and New York was trailing the Blue Jays, 3-0 when Joe Girardi waved in Hawkins to replace Mike Mussina with two outs and runners on first and second in the top of the sixth inning. As Hawkins emerged from the Yankee bullpen the boos began in the Stadium’s bleacher section. It wasn’t anything the huge right-hander had done that was causing the catcalls. It was what he was wearing. 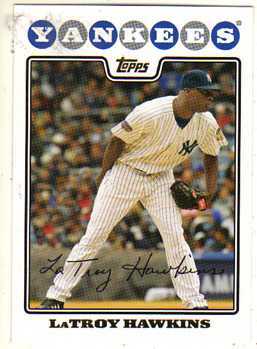 Hawkins had worn uniform number 32 since he had made his big league debut as a 22-year-old starting pitcher with the Minnesota Twins, way back in 1993. That number wasn’t available when he came to the Yankees because it had been retired in honor of Elston Howard. Pirate Hall of Famer Roberto Clemente had always been the Hawkins’ baseball hero so the Gary,Indiana native chose uniform number 21 instead. The problem with that choice was that it had been the uniform number of Yankee fan favorite Paul O’Neill and even though the team had not retired it, Yankee fans, led by the highly emotional bleacher bums, let Hawkins know they didn’t appreciate any one else wearing 21. He then switched jerseys, to number 22. The truth is, however,that Hawkins could have been wearing number 80 on his back and he still would have been hearing boos in Yankee Stadium. That’s because after his first ten appearances that year, his ERA was over ten, as the Yanks struggled to play .500 baseball during the first month of Girardi’s first season at the helm. The shaky start resulted in Girardi losing some trust in Hawkins and calling on him less.The lighter workload seemed to help him pitch more effectively.For the next three months, with the exception of a couple of bad appearances, he gave the Yanks some solid innings and lowered his ERA by five runs in the process. But that didn’t prevent him getting traded to the Astros before the ’08 trading deadline. He then had perhaps the best half season of his career with the Astros. In 24 appearances with Houston that year, he gave up just one earned run resulting in a microscopic ERA of just 0.42. And this guy is still pitching! In 2013, at the age of 40, he was one of the Mets’ best relief pitchers, appearing in 72 games and posting an ERA of 2.93. That effort got him a one-year $2.25 million deal to pitch for the Rockies in 2014. It will be Hawkins’ 20th big league season. Hawkins shares his birthday with this former home run hitter, this former Yankee infielder and a former Yankee outfielder. The 2000 season was supposed to have been D’Angelo Jimenez’s first full year as a New York Yankee. The native Dominican had completed a noteworthy seven-game-long cup-of-coffee stint in the Bronx the previous September, during which he belted eight hits in his twenty at-bats and drove in four runs. That performance had impressed manager Joe Torre, the team’s front-office and many Yankee fans, including me as well. I can remember being certain that this then 21-year-old switch-hitter would be the Yankees’ fifth infielder in 2000. That didn’t happen. In an incident that reminded me of the one that had destroyed former Yankee shortstop, Andre Robertson’s big league future, fifteen years earlier, Jimenez broke his neck in a car accident in the Dominican Republic, one month before the 2000 spring training camp opened. A year and a half later, the Yankees traded him to the Padres for reliever Jay Witasick. While Jimenez had been recovering from his injuries, another Yankee infield prospect named Alfonso Soriano had leap-frogged ahead of him on the organization’s depth chart. Since Derek Jeter, Chuck Knoblauch and Scott Brosius were also firmly ensconced at short, second and third for a Yankee team that had just captured its third-straight World Series, hardly anyone noticed this kid had been traded. Over the next seven seasons, Jimenez would play for six different big league teams. His best stretch occurred in Cincinnati, where he became the Red’s starting second baseman and Barry Larkin’s double play partner in 2003 and ’04. He hit .290 that first year and than poked 12 home runs and set a career high with 67 RBIs the following season. But after getting off to a slow start in 2005, he lost his job to Rich Aurilia. The Reds released him and he spent the final two years of his big-league career living out of his suitcase, as he played for Texas, Oakland and the Nationals. Jimenez is still playing baseball. He played for an independent minor league team in 2012 and than joined the Mexican League, where he hit .328 in 21 games. I still think if he didn’t break his neck, he’d have been a great utility infielder for that 2000 Yankee team, instead of Clay Bellinger, who would hit just .207 in that role. That would have put Jimenez in a perfect slot to take over the regular second base job when Knoblauch’s case of Steve Blass throwing disease started. Instead, Jose Vizcaino was given the position and a year later it was Soriano and not today’s Pinstripe Birthday celebrant who would become a big league all star. Jimenez shares his birthday with this former home run hitter, this former Yankee reliever and a former Yankee outfielder who’s promising career took a u-turn when he slipped on a wet Shea Stadium outfield. 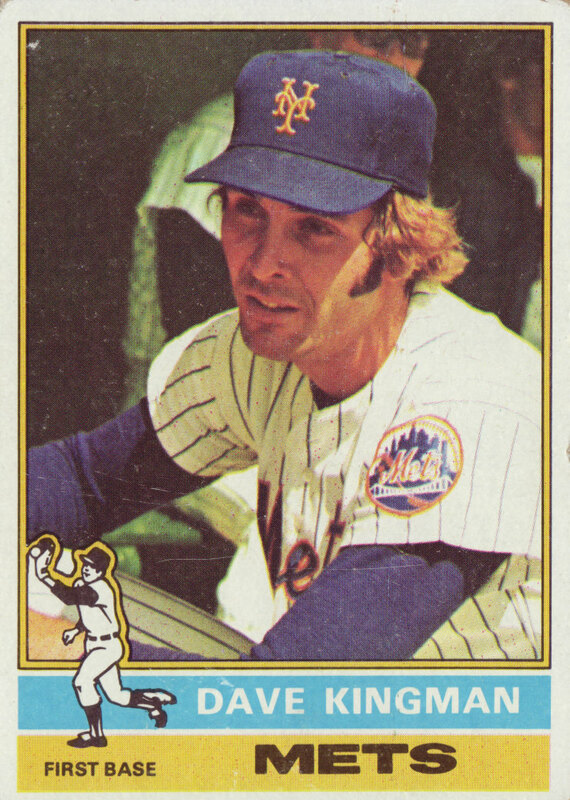 If you’re a baseball fan who is over forty years old, you most likely remember Dave “King-Kong” Kingman pretty well. His big league career lasted from 1971 when he debuted as a 22-year-old San Francisco Giant, until 1986. During that time he put on the uniform of seven different big league teams. In addition to the Giants, those teams included the Mets, A’s, Cubs, Padres, Angels and in 1977 for a very brief time, the New York Yankees. He was a big guy, six and a half feet tall, who could hit a ball as far as any player I’ve ever seen play the game. I have no idea if actual statistics bear this out but I would guess that Kingman has to be among the all-time leaders in percentage of home runs per fair balls hit over a career. His problem was hitting the ball. He was a strike-out machine and since he was overly aggressive at the plate, pitchers could actually get him out by, in essence, pitching around him. Still, I remember being real excited when the Yankees got King Kong Kingman from the Angels for the 1977 pennant drive. I never liked him when he played for the Giants or the Mets, but once he donned the pinstripes, I was ready to love him. He saw his first action on September 17th of that season in a Saturday afternoon game in Detroit. After striking out his first time up, he belted a two-run home run in the third inning, driving in Lou Piniella. He went on to homer in his next two games and in four of his first five. I was disappointed that the Yankees did not sign him after that season. He went on to have some very good seasons for both the Cubs and the Mets before retiring in 1986 with 442 career home runs and 1,816 strikeouts. Kingman was born in Pendleton, OR on today’s date in 1948. He shares his birthday with this former Yankee center-fielder, this former Yankee reliever and this former Yankee infielder prospect. The 1974 season turned out to be a pleasant surprise for Yankee fans. George Steinbrenner had replaced Ralph Houk as Yankee manager with Bill Virdon after the 1973 season and the former Pirate outfielder was determined to make the Bombers his team. He boldly moved fan favorite Bobby Murcer from center to right field, inserted Lou Piniella in left in place of Roy White and named Elliott Maddox as his everyday center fielder. Neither Murcer or White were happy with the moves but they did not complain publicly and the new outfield began producing and preventing runs almost immediately. Maddox had been purchased by Gabe Paul from the Rangers during that preseason. He was an outstanding defensive center fielder and he had a great year offensively as well, averaging .303 with a .393 on base percentage. Murcer turned out to be an excellent right fielder, Piniella hit .305 and White got into 135 games as a DH and fourth outfielder. The Yankees surprised all of baseball by finishing second in the AL East with an 89-73 record, just two games behind a very good Baltimore team. So when the Yankees traded Murcer for Bobby Bonds and signed Catfish Hunter during the winter of 1974, most Yankee fans including myself thought 1975 would be the year the Yankees returned to the postseason. That did not happen and perhaps a key reason why was that Maddox slipped on a wet Shea Stadium outfield in a June game against the White Sox and suffered an injury to his knee that not only ended his 1975 season but also took away some of his speed. In a famous court case, Maddox later sued both the Yankees and the Mets for forcing him to play on a field they knew was in an unsafe condition. Elliott lost the case in the New York State Court of Appeals. After appearing in just 18 games during New York’s 1976 Pennant-winning season, the Yankees traded their damaged outfielder to Baltimore for Paul Blair the following January. The following year he signed a free agent deal with the Mets. He spent his last three big league seasons back in the Shea Stadium outfield. He was released by the Mets after the 1980 season and never appeared in another big league game. 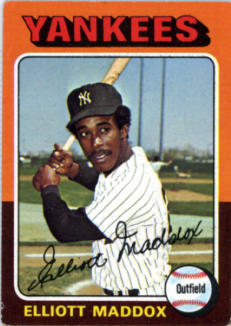 Maddox was born in East Orange, NJ, in 1947. Like Maddox, this slugger also played for both Big Apple baseball teams and currently ranks fifth on the Mets’ all-time career home run list. He along with this one-time Yankee infield prospect and this former Yankee reliever were also born on December 21st.